Belgium students against LAW TRAIN: Professors, don’t wipe your feet on Palestinian human rights! 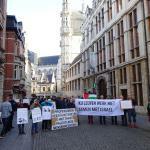 Monday 26th September 2016, about 20 activists protested against the collaboration of the University of Leuven with Israel. During the official opening of the academic year at KU Leuven protesters lay on the street, just before the procession of professors in gowns was coming. The slogan quoted: 'Professors: don’t wipe your feet on Palestinian human rights! ". The Law Faculty of the University of Leuven is in fact part of the LAW TRAIN project, the EU funded research project to develop and share interrogation techniques with Israeli police. The project is led by the Israeli Bar-Ilan University. Activists gathered on the day of the official opening of the academic year at the University of KU Leuven to protest against the participation of their university in the LAW TRAIN project, an Israeli led project, the aim of which is to unify and exchange interrogation techniques between European countries and Israel. The LAW TRAIN project is part of the bigger HORIZON2020 framework, the European funding program for research and innovation, to which Israeli institutions and companies enjoy a privileged access. LAW TRAIN is coordinated by Bar Ilan University and have the Israel Ministry of Public Security, and the Israeli National Police as partners. On the Belgian side the participants are the Belgian Federal Department of Justice and, as the only European university, the Catholic University of Leuven. The project aims to streamline interrogation techniques in a unified technological platform and training of interrogators in working with virtual environments using gaming technology. The national police involved in the project are the Spanish, the Belgium and the Israeli one. The Portuguese government has withdrawn the participation of its police after a sustained civil society campaign. Like other Israeli universities, Bar Ilan University actively supports the occupation and colonization of Palestine. Bar Ilan contributes to the academic training of the feared Israeli security service, the Shin Bet or Shabak, through a special training program for security officers in active service. The Shin Bet is notorious and feared for the torture, blackmail and other human rights abuses during interrogations. With the protest and the open letter by professors the campaign against the involvement of the KU Leuven University in the LAW TRAIN project has taken a flying start, continuing the efforts begun in Portugal. Moreover, last week, there have been two meetings with the rector regarding the participation of the University of Leuven in Law Train. The role of KU Leuven role within the project is to prepare a report on the "legal framework" for the interrogation techniques, making the university complicit in a policy that denies the most basic human rights to the Palestinians. Among the crimes daily committed by the Israeli state, figures the infringement of the right to physical integrity, to property, to housing, to education, to an adequate standard of living, to freedom, to free access to natural resources, equality and self-determination. Activists insist that participating in "LAW-TRAIN" facilitates and legitimises the oppression of the Palestinian people. After the Portuguese government’s decision last month to fully withdraw from the "LAW-TRAIN" project, KU Leuven’s students and professors insist that their Alma Mater follows the example, insisting on the core values of KU Leuven's internationalization policy. ‘Palestinian colleagues enjoy no academic freedom. They are at the mercy of a ruthless occupier. They deserve our full solidarity and support, based on the belief that the values of democracy, freedom and justice can survive only if we are prepared to defend them effectively.’ Students and professors do not want to be associated with a project that helps Israel as a human rights offender to perpetuate its violations. Taking a firm and peaceful stand against this kind of cooperation is the only effective means to end Israeli violations and push the EU to start acting in accordance with the principles of freedom, democracy and Human Rights. In 2011, the Palestinian society together with academic associations and students, sent an appeal to the European academic world to no longer participate in this type of joint projects. ‘Institutional cooperation confers intellectual, financial and political support to Israel, allowing impunity to continue to violate international law and human rights’. Science, like art, does operate within a social, and therefore political and moral context and institutions like the EU and European universities cannot coherently support human rights while funding projects with institutions that systematically violate them. ‘We are absolutely in favor of the freedom of research, but there are ethical boundaries that must not be exceeded.’ Israel has been violating human rights for decades now and Bar-Ilan University together with the Israeli Police are structurally involved in these human rights violations.